In my previous post, I noted how the Fed has recently doubled the supply of base money. At the same time, the price-level (however measured) has shown no correspondingly dramatic change. This led me to question a simple version of a popular theory of the price-level; the so-called Quantity Theory of Money (QTM). Maybe I was a little too hasty. After receiving several thought-provoking comments on that post, I am led to re-think what I was trying to say. The basic idea is that new money used to purchase assets (a la the Fed's MBS purchase program) need not have any price-level effect -- even if the increase in the money supply is permanent. On the other hand, it seems that it is also possible to square the observed phenomenon with a conventional QTM. Below, I discuss both interpretations. To sharpen the discussion, let me write down a simple model. The technology governing the return to capital investment works as follows. Let k denote capital investment at date t. Then the return to this investment is realized at date t+1 and is given by z+ f(k), where f(.) is strictly increasing and concave (diminishing returns to investment) and z+ denotes the realization of a productivity shock. Let ω denote information available at date t that is useful in forecasting future productivity z+. I like to refer to ω as news. Let E[z+|ω] denote the conditional forecast over future productivity. Hence, for a given level of domestic investment k, the expected return to an additional unit of investment is given by the expected marginal product of capital, E [z+|ω]f ' (k). Assume that there is one other asset in this economy: government money/debt (I make no distinction here). Let R denote the gross nominal interest rate paid on government money (think of the interest currently being paid on reserves by the Fed). Assume that R is a policy parameter and that it is held fixed over time; net interest on maturing debt is financed with lump-sum taxes. Π(ω+,ω) = p(ω+) / p(ω). The LHS of  is the expected marginal product of capital and the RHS is the expected real return on government money. Condition  implies that investment demand kd is decreasing in R and increasing in (expected) inflation. Let y denote aggregate saving which, in what follows, I view as a parameter (this allows me to focus on the forces that determine the composition of saving, rather than its level). Consequently, the demand for real money balances is determined residually by qd = y−kd. Given a stochastic process for news, condition  can be used to solve for the unknown function qd(ω). Interpretation. I like to think of this model as capturing an element of banking (or of intermediation, in general). The bank (consolidated banking sector) must decide how to allocate its deposits y between cash q and loans that finance private sector capital spending k.
The term in the square brackets in  is the so-called money multiplier (M1 / M). Note that the money multiplier here is endogenous; it depends on the loan-to-cash ratio (k / q), which is determined by the banking sector in relation to prevailing macroeconomic conditions. [You can verify that p = M1 / y as well]. O.K., so here is what I had in mind vis-a-vis my earlier post. Consider equation  and hold all parameters fixed. Then the equilibrium price-level is determined by pt = Mt / qd (The demand for real money balances remains constant in a stationary equilibrium -- all nominal quantities expand at the same rate as base money...a very QTM result, by the way). What is important to realize here is that the price-level is pinned down by the ratio of the supply and demand for fiat money. While it is also true here that p = M1 / y, the price-level depends on M1 only to the extent that the supply and demand for fiat money influences M1 (i.e., via equation ). Now, imagine that the Fed surprises the market by printing up some new money, using it to purchase some private sector capital (MBS). To my way of thinking of things, the new money created in this manner does not alter the supply of fiat money--even if it does increase the supply of government money. 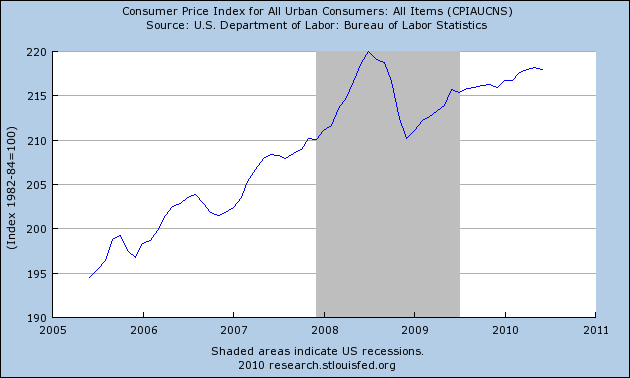 Since the supply/demand conditions for fiat money remain unaltered, the price-level remains unchanged. Note that in this operation, the supply of private money falls by the amount of the Fed purchase, so that M1 remains unchanged. All that has happened here is a relabelling of the currency (the Fed is simply acting like a private intermediary). Prior to the experiment, the total supply of private (backed) money was pk. Imagine now dividing pk into two components: private money and government backed money. An econometrician will observe an increase in base money supply accompanied by disintermediation in the banking sector. But a rose by any other name is still a rose. [rose = backed money]. In the view of some, a recession is caused by a sudden "excess demand for the medium of exchange." I interpret this to mean an exogenous increase in the demand for government money/debt. Of course, as someone cast in the "New Monetarist" mold, I am not inclined to believe in exogenous money demand shocks. People do not, in my view, simply wake up one morning en masse wanting more cash or government treasuries. Well, maybe they do. On the other hand, I do not think it far-fetched to imagine that any change in money demand might not be driven by something more fundamental. The fundamental shock I want to consider here is "bad news." That is, assume that E[ z+ | ω] is increasing in ω, so that a high realization of ω corresponds to "good news" and a low realization of ω corresponds to "bad news." What typically happens near a cyclical peak is the arrival of information that leads private sector actors to revise downward their forecasts on the return to additional capital investments (e.g., new residential structures). A part of the information flow might take the form of rising foreclosure rates, for example. In any case, the point is that the sudden arrival of bad news leads to a form of rational pessimism. What are the implications of a bad news shock in the context of the model developed here? Properly, we should study . But it turns out that the basic intuition can be gleaned equally well from  and interpreting an exogenous decline in z as a bad news shock. Mechanically, condition  asserts that the real demand for government debt qd is decreasing in z. This follows from the strict concavity of f(.). So a decrease in z leads to an increase in qd; an econometrician is likely to identify this event as a positive money demand shock. Intuitively, bad news leads banks to rebalance the composition of their assets--they want to contract their lending activities (the forecasted returns are no longer as attractive) and they want to substitute into higher grade government money/debt--there is a "flight to quality." The consequent increase in money demand is deflationary (in the model, there is a sudden drop in the price-level). Recall: pt = Mt / qd . The contraction in bank-lending leads to a subsequent drop in (expected) GDP, owing to reduced levels of investment today. Note that the decrease in (k / q) here results in a decrease in M1 and the money multiplier, even for fixed base money supply M; see condition . Needless to say, this effect (disintermediation) seems present in the data. Now, according to this interpretation, the decline in the price-level was avoided by recent Fed actions. In particular, the Fed increased the supply of (interest-bearing) fiat money to accommodate the apparent increase in demand for these government liabilities. Note that, according to this view, the Fed had better stand ready at some point in the future to reverse its money injection, if a huge increase in the price-level is to be avoided (once good news returns, and private investment demand picks up). I'm not sure which interpretation I like better. It is possible that both interpretations contain an element of truth. You tell me (maybe you think both models are lousy). Let me address what I think will be one sure criticism. The model I use above makes no distinction between government money and debt. To put things another way, money is treated simply like any other asset. In fact, money--in the form of cash--is special; it is a medium of exchange. The model here simply views money as a store of value. Well, the first thing I would say in response to this is that at least my model has money! (unlike, say, conventional "cashless" NK models). And anyway, the money/debt object in my model does circulate as a medium of exchange. In the OLG model, for example, the asset passes from one group of agents to another in a sequence of spot exchanges. I might further add that the existence of government money/debt is welfare-improving in the model (of course, I have not modeled the government as potentially exploiting its monopoly on fiat for the purpose of extracting seigniorage -- such an extension is possible, but beside the point here). But ultimately, my response is this: what phenomenon might be better understood, in the context of the present discussion, by distinguishing money from debt? You tell me how what I have done here is in any way misleading because of my failure to take the medium of exchange role of money more seriously. It is interesting to note that in making no distinction between money and debt here, the Fed finds itself in a perpetual liquidity trap. That is, any swap of money and bonds is completely irrelevant for anything real or nominal. The two objects are perfect substitutes in the model. In fact, I think this describes the current situation along one dimension rather well. In particular, interest-bearing reserves are virtually indistinguishable from government treasuries as far as banks are concerned (so swaps of treasuries for interest-bearing reserves should have little, if any, consequences). Along the same vein, if you want, think of the case in which R = 1 (zero nominal interest rate). This is the scenario that most people associate with a liquidity trap, but as the preceding discussion makes clear, one does not need to hit the zero lower bound to speak of liquidity traps. One of the ideas that stuck in my head as an undergrad was the proposition that "inflation is always an everywhere a monetary phenomenon." The idea is usually formalized by way of the Quantity Theory of Money (QTM) -- or more precisely -- the Quantity of Money Theory of the Price-Level. (QTM is not a theory of money, it is a theory of the price-level). In its simplest version, the QTM asserts that the equilibrium price-level is roughly proportional to the outstanding supply of money (however defined). As inflation is the rate of change in the price-level, the phenomenon of inflation is attributed primarily to excessive growth in the money supply (typically viewed as being controlled by the monetary or fiscal authority). Stories of interwar hyperinflations and tight correlations between secular or cross-section plots of inflation against money growth is likely what cemented the idea in my head. As the teaching assistant was fond of telling us: "Inflation is caused by too much money chasing too few goods." Well, duh. Alright then, let's consider the following data, which plots the evolution of base money (money created by the central bank only) since 2005. No, this is not Zimbabwe...it is the United States. Since the fall of 2008, the Federal Reserve has more than doubled the supply of base money. Yikes! Is it time to buy gold and guns? Well, maybe. Or maybe not (not yet, anyway). As the next figure shows, there is something conspicuously missing from the QTM story...where the heck is all that predicted inflation? 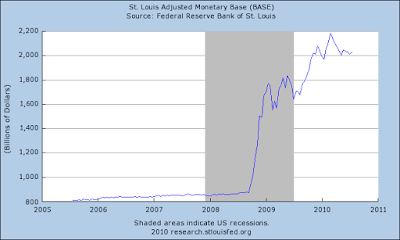 As Ron Paul is fond of stressing (ad nauseam) , the Fed creates (base) money out of thin air! It's a puzzle that intrinsically useless fiat can possess market value in the first place. But given that it does, it is even more puzzling that doubling its supply does not halve its value (double the price level). What's going on here? The answer is that there are a lot of things going on. I can't possibly talk about everything in one post, so let me focus on one thing here. The idea is this: perhaps the Fed is not simply creating money "out of thin air." The first figure above shows the evolution of the size of the Fed's balance sheet (liabilities) over time. The following link shows the composition of the Fed's balance sheet (asset side) over time: see here. Normally, most of the Fed's assets are in the form of U.S. treasuries (promises to pay future dollars). The Fed is currently holding about the same amount of treasuries as it did prior to the financial crisis. The doubling of assets we see today is attributable almost entirely to the Fed's purchase of agency (Fannie and Freddie) debt in the form of mortgage-backed securities (MBS). The first thing to stress is that the MBS purchased by the Fed did not consist of existing "toxic" assets. The purchases consisted of new-issues; that is, the highest rated mortgages made after the substantial decline in house prices. Moreover, it is my understanding that these products are essentially guaranteed by the Treasury. And indeed, the income generated by these purchases (rate of return roughly 5%) is in large part what allowed the Fed to remit an additional $25 billion to the treasury last year; see here. Question: what sort of "bail out" generates $25 billion for the U.S. taxpayer? So you see, the Fed did not simply create new money out of thin air. It created the money out of your mortgage, which in turn, is an income-generating security backed by a real asset (your home). Now, we might all agree that creating fiat money and distributing it willy-nilly throughout the economy (helicopter drops) is ultimately inflationary. But this is not what is happening. It is by no means clear to me that an asset-swap of this form (money for MBS) is intrinsically inflationary. It all depends. What does it depend on? Well, above all, it depends on the underlying quality of the assets backing the MBS. If these prime mortgages start to default en masse, then we have a de facto helicopter drop of cash, and this will be dilutive. An analogy to keep in mind here is that of a company, say Microsoft, financing the purchase of new capital (say, a takeover of some smaller firm) by issuing new equity. New shares are created "out of thin air." But is the new share issue dilutive (would it depress the purchasing power of existing shares)? The answer is that it depends. If the acquisition is accretive, then share value is likely to increase (the effect is deflationary). On the other hand, if the acquisition turns out to be a bust, the new share issue will be "inflationary." Note: one may want to argue that an increase in the supply of shares is not the same thing as an increase in the supply of Fed cash; the latter is relatively liquid (it circulates widely as a medium of exchange). But imagine that Microsoft shares also circulated widely as a medium of exchange...would this fact alone imply that the new share issue described above is necessarily dilutive? Money, like equity, is an asset; and its value (purchasing power) depends primarily (though not exclusively) on what backs it. evidence thus contains lessons for modern monetary policy. Further reading: Money as Stock (John Cochrane). Which then raises the question: how can you believe that, and not also believe that if the U.S. government were to borrow some of the cash corporations aren’t spending, and spend it on, say, public works, this would also create jobs? (Brad DeLong has tried to make this argument repeatedly). The key question, in my view, concerns the reason(s) for why firms appear reluctant to undertake new capital projects. If I understand the Krugman and DeLong worldview correctly, firms are reluctant to spend because they fear that future demand for their products will fail to show up. Their collective fear somehow becomes a self-fulfilling prophesy. Because firms fail to invest, they fail to hire workers, and hence, workers fail to generate income--the income that would have been necessary to purchase the added future production. Something like this (I welcome clarifications). There may be an element of truth to this. But there may be other reasons underlying the collapse in investment spending. And, as usual, different interpretations may lead to very different policy implications. There is no question that firms appear "fearful" of investing. The question, I think, is whether this fear is rooted in fundamentals, or whether it is simply a byproduct of market psychology. I see several good fundamental reasons for being afraid to invest. First, there has been a massive overinvestment in residential capital (largely a byproduct of government policy) and this needs to be worked off. The same likely holds true for other forms of business capital. In short, it is simply not a good time to invest. Additional investment may employ more people, but this is just throwing good money after bad (some people gain in the short-run, but society loses on net). Second, in addition to being scaled back, employed resources need to be reallocated to their most productive uses. Workers may have to change locations or professions (or both), idle capital needs to be matched with new owner/operators, etc. This is a process that takes time. It is not clear why the government should have to interfere with this adjustment process (it should, if anything, encourage it). Third, there is currently a high degree of uncertainty over the path of future government policies. I am not sure that I, as an employer, would want to make the commitment to hire a new worker not knowing what the future payroll tax will be, or what health care costs may be. The Krugman and DeLong tonic seems to be that government spending is needed because the government--unlike the business sector--is not afraid of the effect of its future policies on the business sector's income/balance sheet statements. Hmm...OK (I think). Note that I am not necessarily against the idea of new public works in the current environment (in fact, I think one could make a very good case for it). I think that proper NPV calculations should be used to judge whether individual government projects should go forward or not (just like any other investment project). Instead of carefully worked out NPV calculations for specific projects, Krugman and DeLong want to cite studies of huge fiscal spending multipliers which assure that any government spending will have huge returns to society (not just those employed in the works). Is this simply the product of wishful (and lazy) thinking? Let's get serious, people. Krugman and DeLong write as if they think that the goal of society is simply to create jobs. I am reminded of a news column I read from the Soviet news agency (Tass), written in 1957, which stated (in translation): "The unemployment in the USSR is currently zero percent, as it has been for the last two decades." I am not sure that shipping idle workers to Siberia and forcing them to stuff cotton balls in empty aspirin bottles was the best use of that economy's workforce, but it certainly had the effect of miminizing unemployment. Clearly, there is more to the resource allocation problem than simply creating jobs. In my younger days I worked as a drywall finisher (we called ourselves "tapers"). I worked on commercial sites and residential sites, union and non-union jobs, by wage rate and by piece rate. Yep, I did it all (and no, I am not available to do your basement). When the recession hit the Vancouver construction sector in 1981, I could no longer find work and, after a brief spell of unemployment, I went back to school. Well, looking back now, I'd say that there was plenty of work available, but none that would have compensated me enough to forego my next best opportunity. And looking back, I am struck at how I never believed, even as a kid, that my transition from employment to unemployment to out of the labor force had anything to do with a sticky nominal wage. And I believe that Keynes would have agreed with my assessment. That is, a careful reading of the General Theory reveals that Keynes never assumed sticky prices, except briefly, as an expositional device, and in the form of a fixed nominal wage. Indeed, later on in the GT, he explains why the economy might function much better if wages were in fact sticky. Evidently, the mechanism he had in mind has little, if anything, to do with the one emphasized in a standard New Keynesian (NK) model. A defining characteristic of the NK paradigm is the existence of price-setting agents who find it too costly to adjust (product or labor) prices at high-frequency, and who are somehow behaviorally committed to deliver goods (products or labor) in a market at historically outdated terms of trade. What is it that motivates this modeling device? Alright then, the data show sticky prices and the NK model has sticky prices. So what is there to argue? In fact, something very important: Do not confuse measurement with theory. The sticky price hypothesis is a theory; i.e., a proposed mechanism designed to interpret the data. And while the theory arguably has some empirical support, it is not as strong as one is generally led to believe. Sticky price models calibrated to match the observed average duration of price changes (just over one quarter) imply relatively benign consequences. Things get uglier when trying to match model predictions to microdata; see Klenow 2003. These considerations have led some economist to explore other avenues of "stickiness;" e.g., the "sticky information" models posited by Mankiw and Reis (QJE 2002). There may be more than one way to interpret the available evidence. Figuring out which interpretation is best (most accurate) is important because different mechanisms frequently lead to very different policy conclusions. I have my own favored hypothesis that I'll share with you shortly. But before I do so, I want to describe the way I think many people organize their thoughts on this matter. I imagine that many begin by conjuring up, in their mind's eye, a pair of Marshallian scissors (supply and demand). If markets work well, then prices should be determined by a market clearing condition (scissor intersection). Because the economy is constantly changing (subject to shocks), one would expect nominal prices to change at high frequency too. But they do not. Ergo, it must be the case that (at least some) markets do not clear. Because the market mechanism is now revealed to generate mismatches in supply and demand, there is a clear role for government intervention. This latter conclusion is taken to be obvious vis-a-vis the market for labor, where the very existence of unemployed workers is taken as prima facie evidence that markets do not clear. The economy, evidently, has a "potential" or "natural" level of GDP or employment, and deviations away from this "long-run" level (output "gaps") are the product of "shocks" together with the inability of the markets to clear in the short-run. Please enter, the stabilizers (monetary and fiscal policy). Well, that's one way to think about it. Certainly, some variant of this line of reasoning is taught to most econ undergrads. The educated layperson is regularly exposed to this view in blog posts of pop economists. Many, if not most, Fed economists (not here in St. Louis) take this view too. A majority opinion, however, does not make it correct or, more precisely, the best interpretation possible. Let me explain. Walras' auction and Marshall's scissors have justifiably had a large influence in the way generations of economists have organized their thinking about price-quantity determination. I am not sure, however, that the underlying assumptions are always well understood. A defining characteristic of these theoretical market mechanisms is the assumption of anonymous participants in centralized exchange settings. In a competitive setting, trades are intermediated by a fictitious auctioneer (a metaphor for unmodeled "market forces" that equate supplies and demands). 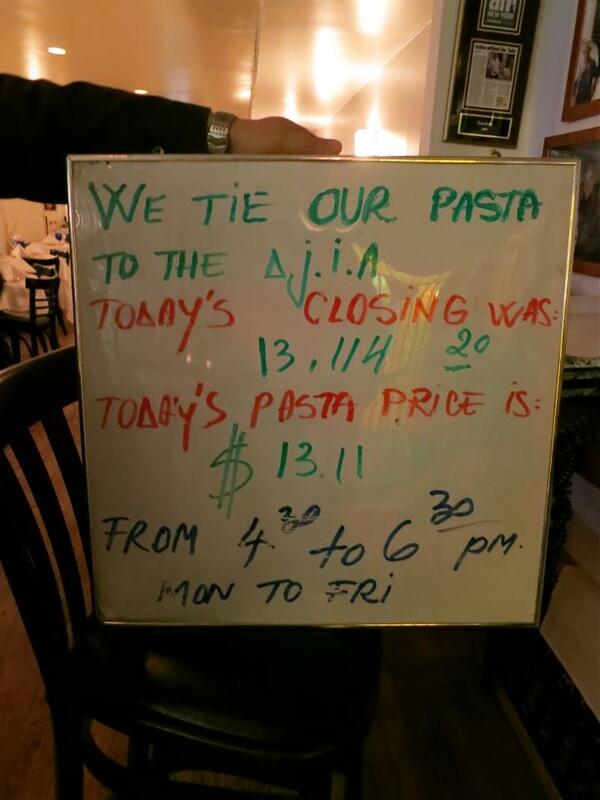 In monopolistically competitive settings, agents set prices (assumed to be linear, and so, inefficient). I want you dwell on this for a moment: anonymous people trading in centralized exchanges. It is an abstraction adopted in neoclassical and NK theory. The abstraction may be innocuous in some applications, but not for others. 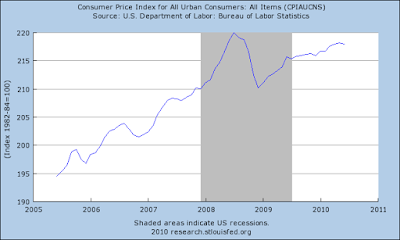 What does the abstraction rule out and why might this be important for interpreting price data? To begin, anonymity rules out the existence of personal trading relationships. Every morning, you wake up and dispose of your goods or labor in some central location to some anonymous group of purchasers (wham bam - thank you ma'am, so to speak). Because trading relationships are absent, the terms of trade are "static" in the sense of being determined on the spot among transients. And because this is so, the spot price has--by assumption--an enormous role to play in determining how resources are allocated in spot exchanges. In particular, if the spot price is for some reason sticky, spot allocations will generally be inefficient (spot markets will not clear). It strikes me as self-evident that most labor, as well as many goods and securities, are not transacted in the manner of (say) wheat or equity shares in General Motors. Many markets more closely resemble the marriage market, where durable (or semi-durable) relationships are formed (and terminated) in decentralized exchanges. In bilateral (or multilateral) relationships, your identity and history matter--you are not anonymous. The same is true of many goods and securities markets. Retail and wholesale outlets expend great effort to cultivate relationships with their customers. The same is true in over-the-counter securities markets. Understanding this fact turns out to have, I think, a profound implication for the way in which one interprets price data. Why is this? Let me explain. When a pair of traders meet bilaterally, there may be gains to trade (a surplus) by forming a relationship and trading over time (until match separation). The gains to trade refer to the capitalized value of the surplus; that is, the present value of a sequence of "spot" surpluses (let me call this the match surplus). In such a relationship, there is no sense in which a Walrasian or Marshallian market "clears" in every spot exchange that occurs throughout the relationship at every point in time. Instead, the match surplus is divided by way of a bargaining process that prescribes (either implicitly or explicitly) an entire sequence of prices (or wages) over the life of the relationship. Now here's the rub. It is not immediately clear whether anything uniquely pins down a negotiated wage/price path over the life of a relationship. In fact, in many theoretical bargaining games, the "equilibrium" price path is largely indeterminate. Evidently, there are many different ways to slice a pie (match surplus). You can pay me a lot today, and a little tomorrow--or the other way around. In many cases, it really doesn't matter. Either way, both parties presumably allocate their combined resources in a manner to maximize match surplus, independently of the time path of the terms of trade. In decentralized relationship markets, the notion of "market clearing" needs to be modified. The simple fact that nominal prices are sticky does not constitute evidence that the relevant market is not clearing in an appropriate sense. Note that this does not imply that there is no role for government intervention. In particular, it is possible that while resources within a match are allocated efficiently, resources economy-wide are not (this may happen, for example, if there are externalities in the search market). According to this interpretation, unemployment (workers without a job, but who are looking for jobs) is entirely unrelated to the phenomenon of observed nominal wage stickiness. Unemployment is instead an equilibrium phenomenon--the byproduct of search and matching frictions and shocks that alter the value of match formation and job retention. No amount of price flexibility, whether real or nominal, will ever eliminate unemployment in a growing and dynamic economy. (It is possible, of course, for unemployment to be too high or too low, or to vary too much, or not enough). What accounts for the enduring popularity of sticky price models? I'm not sure, but here are some possibilities. First, they do the least violence to the comfort of Walras and Marshall. Second, they imply that money is non-neutral; something that central bankers are particularly fond of believing in. And third, they appear to rationalize (legitimize) interest rate policies like the Taylor rule. I'm not sure that these are particularly compelling reasons (although, there may be others -- feel free to share). First, perhaps we should do violence to Walras and Marshall (search and bargaining theory is one way to go). Second, it is easy to generate money non-neutrality in models with full price flexibility (and heterogeneous consumers). Third, modeling financial (instead of price-setting) frictions would turn attention away from simple Taylor rules, diverting it to other (arguably more important) aspects of central banking (payments system, lender-of-last-resort, etc.). In conclusion, I have a hard time taking the sticky price hypothesis seriously. The theory literally implies that if prices were fully flexible, many of the worst properties of recessions would be avoided. There would be no liquidity traps, no financial crises, and no lost decades. Conversely, if prices are sticky (in the theoretical sense), simple government policies, like raising the long-run inflation rate or expanding government spending, can evidently restore something close to economic nirvana when the economy is in a liquidity trap. More than one prominent econblogger appears wedded to this view. I remain skeptical of such easy fixes. From Arthur Robson, a restaurant in Vancouver, B.C.